From this chart you can see that, off the pad, the Saturn V first stage is doing about 1.2g; this climbs rapidly as atmospheric drag falls and fuel mass is consumed. The center engine is intentionally shut down to limit acceleration, and the outboard four keep pushing to a max of about 3.9g. This is the highest acceleration in the mission until re-entry and landing. 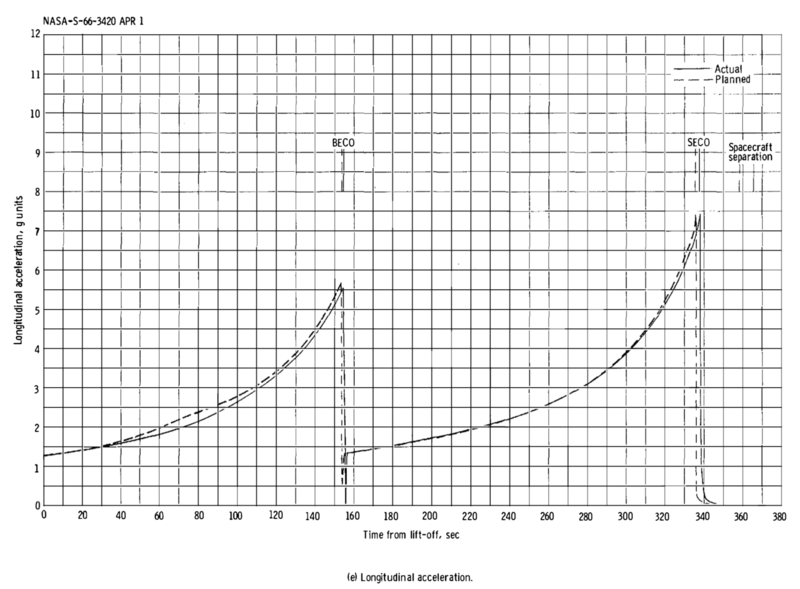 The upper stages are less dramatic in their acceleration but follow similar increasing curves; the second stage curve steps down once for the center engine cutoff and once again when the fuel-to-oxidizer ratio is switched ("EMR Shift" on the graph, for Engine Mixture Ratio) -- this is done to optimize Isp in vacuum, with the timing dynamically chosen to ensure simultaneous depletion of fuel and oxidizer. 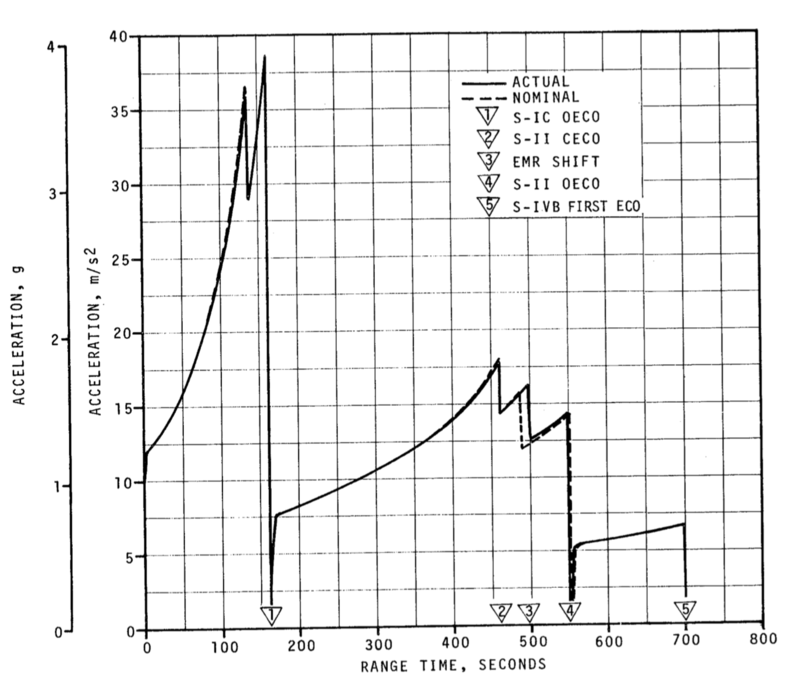 The second stage center engine early cutoff is done to reduce longitudinal (pogo) vibrations rather than to limit acceleration; this was instituted starting with the Apollo 10 flight. 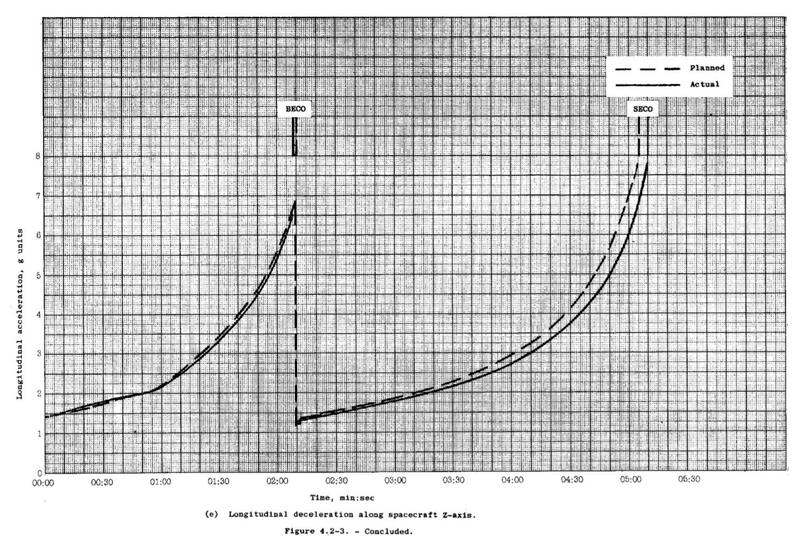 The third stage doesn't use all its fuel in this portion of the mission; most of the fuel load is for the later lunar injection burn, and that's why its acceleration curve is so flat in comparison to the others. Mercury-Atlas missions were more dramatic: 1.35g off the pad, peaking around 7g just before the booster engines shut down and dropped away, climbing again to almost 8g before the sustainer ran out of fuel. Both Atlas and Titan were designed as ICBMs, so not really optimized for human comfort. The Space Shuttle was much more gentle in comparison; at solid booster burnout it reached the first peak of 2.5g, briefly falling a bit below 1g then slowly picked back up to 3g on the main engines; the mains were repeatedly throttled down to hold about 3g for a little over a minute. I think Soyuz does under 4g on launch. Other things being equal, a higher-g launch can be more fuel efficient, because less energy is lost to gravity by getting to orbit more quickly, and gravity losses normally dominate over drag losses. Keeping STS down to 3g was a challenging design goal - it's hard to build deep throttling capability into an engine, but the shuttle was designed to carry (relatively fragile) scientists rather than ex-military fighter jocks. Soyuz is a bit of a compromise there. Falcon 9 starts at about 1.15g, and depending on payload would have a first-stage peak acceleration of around 4.5g, but it appears to throttle its engines back toward the end of the first-stage burn to maintain closer to 3.5g. I haven't found a good time series graph of reentry force, but the peaks are relatively brief -- force increases as the capsule descends into denser air, but decreases as the capsule slows, so the higher the decelerating g-force, the shorter it's going to last. Mercury astronauts took about 11g peak force on re-entry, Apollo about 6.5-7g, space shuttle about 3g. Again, Soyuz does about 4g here, I think. There may be a pretty good jolt at touchdown/splashdown, too. Some of the Apollos hit rising waves at the end of the ride for very brief 15g bump. STS and Soyuz g-forces are necessarily low, again, because they carry civilian crews. In the case of the shuttle, again, it's a major design consideration: the gentle re-entry means the ship has to deal with a prolonged period of high thermal load, which requires fancy and vulnerable ceramic tiles rather than a simple ablative heat shield. To answer your second question on the astronauts' experience and how much thought went into adjusting the g-force profile of a launch, NASA published a document that contains information on the g-force survivability range of a human. Here is the Paper, the relevant figure you want is Figure 5 which is about halfway down the page. The figure is a plot of g-forces in the y axis and time in the x axis with highlighted regions of survivability. Problem with using fabric based hulls is that volume counts more than mass. Default at ten tonnes and fifteen megaschmuckers providing two hundred parsec tonnes. Twenty percent decrease in tonnage gives four tonne overhead and four tonne core/capacitors at three and three quarters megaschmuckers. Though if cost is calculated at de facto per tonne, three hundred and seventy five kay schmuckers, that's three megaschmuckers. Minimum ten tonne jump drive, six tonne core/capacitors, that's a performance of three hundred parsec tonnes at a cost of three and a quarter megaschmuckers. Make it a budget version with energy inefficiency, it costs 2'812'500.- Credite Imperiale and needs 39 energy points to transition three hundred parsec tonnes. For the default ten tonne jump drive, overhead/capacitors are five tonnes, and core/capacitors are another five tonnes; while you really don't have to worry that much of deterioration of the capacitors with extensive use, at seventy five percent discount, I certainly wouldn't mix them with default capacitors, not that it is clear that accelerated deterioration is part of the one shot process. As such, you initially remove the capacitors, and are left with four tonnes each of overhead and core at nine megabux, which results in 1'125'000 CrImps per tonne, at seventy five discount 281'250 CrImps per tonne, with a further budgetted variant at 210'937.50 CrImps. Bare overhead weighs in at 3.2 tonnes, budgetted capacitors have a 62.5 energy point capacity per tonne at 562'500 CrImps. Target four hundred parsec tonnes. Required would be double of initial core at 6.4 tonnes, plus overhead at 3.2 tonnes, equals 9.6 tonnes at 2'700'00 CrImps, budgetted 2'025'000 CrImps. Minimum one shot capacitors for 52 energy points is 0.832 tonnes, round that off to 0.9 tonnes at 455'625 CrImps, budgetted 341'718.75 CrImps. End result ten and a half tonne one shot jump drive rated for four hundred parsec tonnes, at 2'366'718.75 CrImps. Compliant mechanisms have lots of advantages over traditional devices. At the above link, you can download 3D-print files to make some of the objects in the video, plus learn more about compliant mechanisms. And possibly, missile arming safety switch. Dr. Stafford's talk discusses his ideas of using nanotechnology to convert waste heat into electricity. In particular, he shows how we might take advantage of quantum oddities in the way heat is transferred across specific atomic structures, so that we could produce cost-effective, non-polluting electricity. Humankind wastes a lot of energy, but thanks to new technologies, it is increasingly affordable to harvest and use it. At a recent energy summit in Washington, one of the participating commercial firms exhibited photovoltaic cells that turn waste heat into electricity. You can not convert 'waste heat' into electricity. you can only convert a temperature gradient into electricity, which in turn generate waste heat. I don't pretend to be a physicist either, but if you have to sink that heat any where, I'd dump it into the fusion reactor. It seems pretty much equivalent to perpetual energy, if you use it to force a cycle through a steamish type turbine, whether the material is hydrogen, water or liquid metal. The principles of the laws of thermodynamics are pretty easy to learn, but the most basic one is heat energy goes from where it is hot to where it is cold. The laws of thermodynamics are very well understood and have yet to be contradicted by any observation or experiment. The other way to dump heat would be diverting it to plasma and fusion weapon systems, since the material gets expelled, and new material has to be heated up. Battle of the Dreadnoughts, A Star Wars Short Film, sees the Eclipse Super Star Destroyer -- one of the Empire's most devastating weapons -- face off against the New Republic's Viscount Class Star Defender in a Star Wars Legends space battle for the ages. Welcome to Century 21 Tech Talk, a brand new video series hosted by International Rescue's resident genius - Brains! In this briefing, we'll be learning about Fireball XL5, the pride of the World Space Patrol! Oxygen pills and surviving contact with vacuumed space. Archer 1999 premieres this May on FXX. I kinda suspected that the next season would be futuristic; the other genres would have been Renaissance, Enlightenment, Regency, Victorian, Western, Civil War, Great War, Roaring Twenties, fantasy, ancient or medieval. A look at the USCM's UD-4L "Cheyenne" Utility Dropship, and the incredible detail put into it by James Cameron & Co, as shown in the Aliens: Colonial Marines Tech Manual. The weapon pylons could act as aerofoils, properly configured and streamlined.